is played to avoid a black pincer (see 3-4 point distant low approach) . Black can answer with , which emphasizes the left side. 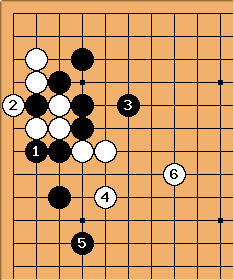 White usually tries to make a base and territory with . 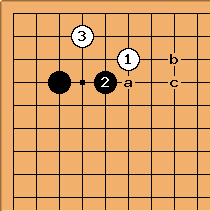 In a Kobayashi formation where Black has a stone at a or b, the logic of is clear. and form an alternative. 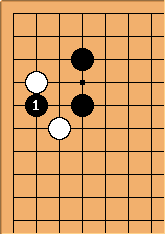 White can play this way if Black is strong in both directions; its main intention is to stop Black from getting too strong, rather than create something for oneself. After , black can take the corner with a move at , reverting to a 3-4 point distant high approach joseki, or fight back with . 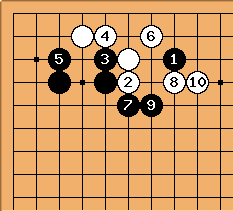 In this joseki, White takes influence towards the top, black influence towards the left and territory in the corner. 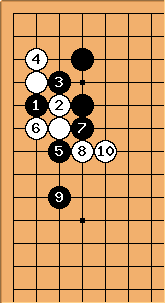 Black may play tenuki after ; if he does choose to further strengthen his position here, black a is most usual. Locally, this looks better for Black, but on the board as a whole, White has succeeded in foiling Black's plans of building a large moyo. However, the usual answer is here. Black has three different answers, from a to c. Black a builds up the left side, Black b tries to build a position on the top while attacking, Black c may be either aimed towards building thickness or towards attacking. Robert Pauli: According to Alexandre Dinerchtein, commenting game four of the 2004 British Championship, there also is the new Korean d and the trick e. Added e below, someone else please add d.
Bill: For d see this Japanese site (Broken Link ?-kokiri). There are many variations, and it does help to read some Japanese characters. 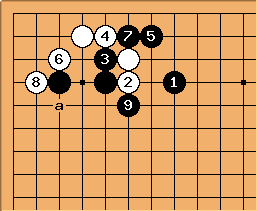 has a clear objective - black wants to make a wall facing the left side. With and he continues in the same manner. 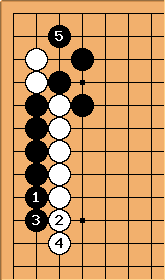 White can decide to exchange White a for Black b or c after or . 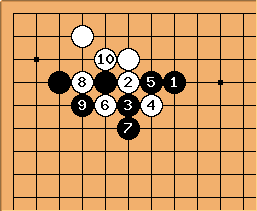 is another move that is often played here. This is one possible variation, there are several more. The timing of is an issue here - it is sometimes delayed until after , or not played at all. attempts to attack White. 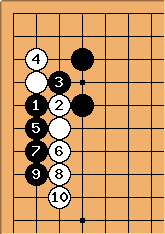 Black needs to have some support in the upper right to play this move. 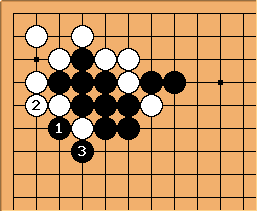 Instead of fighting like above, Black can choose to confine White to the corner as in the sequence here. Nowadays, here is more common. 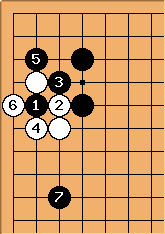 The turning point in this joseki comes at . 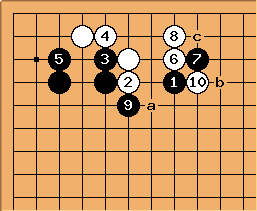 Here White strengthens herself, creating a group on the top side , allowing Black to take the left side. 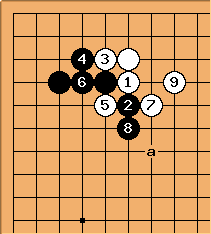 White's second choice is to jump into the center, and find the space for her group there. 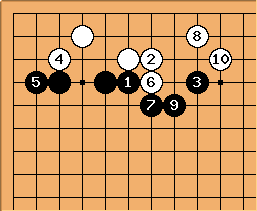 Black will usually make territory on the right with after exchanging for (there is usually a black stone at or around a in this joseki). 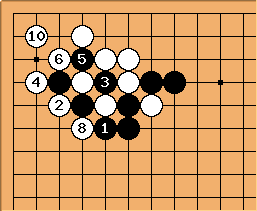 The sequence to 7 follows, where black creates a group on the top, while White develops towards the center. If Black wants to attack from the topside, playing at 5 is the move. If Black wants to build thickness, he plays and . The sequence that follows is long but has few branches. 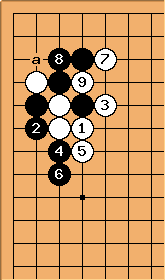 In this sequence White takes the corner and sente, while Black builds thickness. Black can also play here. 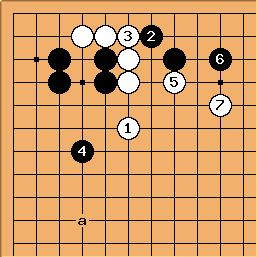 now becomes an attacking move similar to what Black 1 at 6 would have been. Here is one variation. 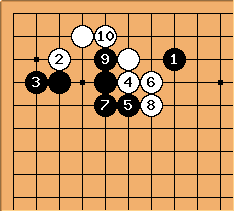 Black 5, attempting to get in a useful kikashi, is a Korean development from the early 1990s, and nowadays has all but outcompeted the old joseki of playing immediately. 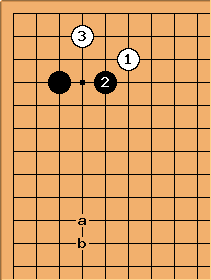 The idea behind this move is that if the sequence continues as in the last diagram, black will be much aided by the fact that c in that diagram is now his sente. Instead, white is more likely to fight as in this diagram. A possible follow-up is at b.
Robert Pauli: at would allow White to bend in sente, OK, but why not at ? 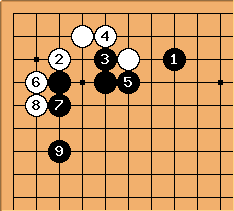 CJ: This result is slightly favorable for white because of the tiny crawl but also because of the refutation using black nose tesuji which is actually favorable for black. CJ: This is the best way for white and black. The result is equal. In other words it is a trick play without favorable refutation. 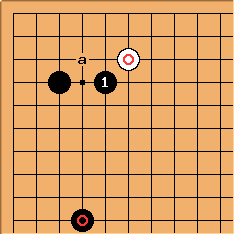 Black 10 at A. 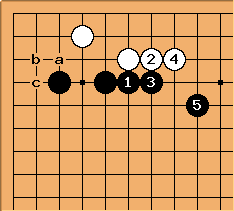 White often plays this approach in the context of the Kobayashi fuseki, meaning that the marked black stone is present - in fact in that case this has become the standard way. 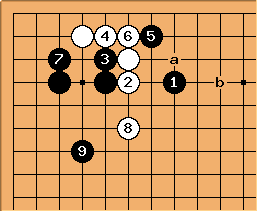 In that case is at least as common as the diagonal play at a, with the obvious meaning that Black gives priority to building up the left side.